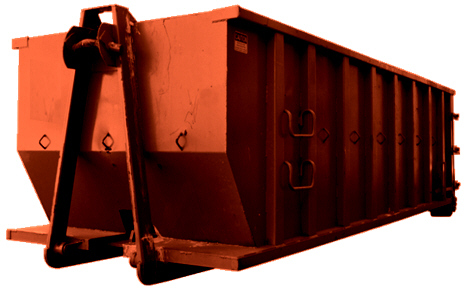 We are one of the largest 10 and 15 yard Rubber Tired Dumpster Rentals Companies in the St. Louis, Missouri area. If you have less than 45 total squares (single layer, two layers or three layers) of shingles to tear off, then you can rent our rubber tired dumpsters and save money. 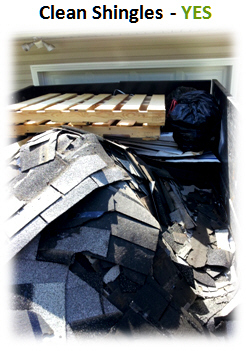 Most Insurance companies pay up to $400.00 for disposal of roofing material. If you choose to recycle your shingles then you can save some money. *Prices and Sizes are subject to change without notice. You will notice a painted line in the bottom of the dumpster with three Xs located by the back doors of the dumpster. When loading the dumpster, load the shingles evenly in front of the line. 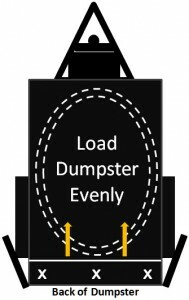 If everything piles up in the back of the dumpster, the weight becomes a transportation hazard. We will not transport the dumpster until the load is evenly distributed. If our driver has to re-distribute the load there will be a minimum of $50.00 and $100.00 per hour charge to credit card on file, for re-distribution. Keeping the dumpster clean with these three materials will allow us to recycle your roofing shingles at a Shingle Recycling Facility. All other Roofing Materials must be bagged and placed on top of the shingles. See Below Instructions. What about the other roofing material that is not recyclable? How do I dispose of these materials? NOTE: Wood Chips, Small wood debris must be placed in provided plastic bags. Beverage Containers, Cups, Bottles, Cans, etc. These Items must be bagged in Plastic Trash Bags that are provided when you rent our dumpsters, and then placed on top of the clean shingles. What if trash and debris gets mixed into the dumpster? 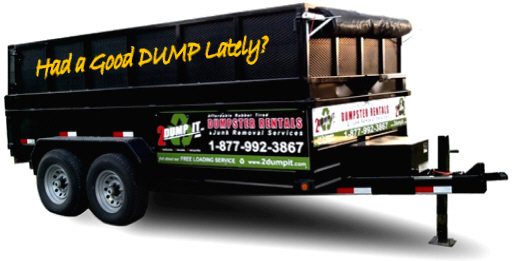 If any of the above mentioned material is mixed into the clean shingle dumpster that has be en rented and paid for as a clean dumpster, then it is up to the drivers discretion if he can quickly clean and bag material in order to recycle the shingle load. 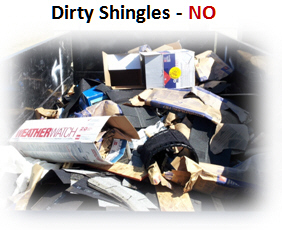 If he deems it as too DIRTY to recycle, then we will dispose of the shingles as typical construction debris. The additional tonnage and fees will be charged to the credit card on file at time of disposal. If the driver takes the time to clean the shingles to recycle, then we will charge a minimum of $50.00. What if I have additional household items, trash, junk that I want to put in the dumpster? 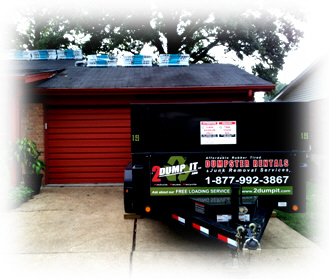 If you rented a Clean Shingle Dumpster, then the items will either be removed before hauling and a minimum of $50.00 will be charged to credit card on file, or we will consider the dumpster as DIRTY and take the dumpster to a trash disposal facility and the additional tonnage and fees will be charged to the credit card on file at time of disposal. If you have questions please call (636) 236-8510 and speak to one of our representatives.